Playing slot game in an online casino can be the easiest thing to do, especially to a newbie that knows nothing yet. Many of the online gaming software today have developed numerous slot games for their loyal players to play. The Evel Knievel Slots is just one of the great slot games from Vegas Technology. Evel Knievel is a 5-reels 20-paylines slot with crisp graphics and sound that is inspired by the American motorcycle daredevil team. Crisp icons include a sports car, motorcycle, trophy, helmet, heart, ring, trucks and a number one. Winning in this slot game has never been easy with the help of its bonus round games and power symbols that completes a winning combination. Since WGT former Vegas Technology develops the Evel Knievel Slots, fans of the mischievous Robert Craig Knievel can now experience the motocross action, as they play the Evel Knievel Slots on casinos powered by WGT former Vegas Technology. Playing on these casinos are safe as they offer fair play to their players through their machines that run in random manner. 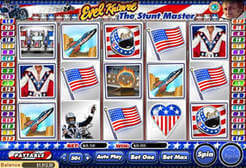 With the help of the power symbols, players can easily win big prizes with Evel Knievel Slots. These symbols include the wild, scatter, and the bonus symbol. The Wild Symbol is the one responsible for substituting any icons in order to complete a winning combination. In this slot game, the #1 icon works as the wild symbol. It will substitute all the other icons except for the wheelie and the trophy icon. Aside from simply substituting and completing a winning combination, the #1 icon also has the ability to double the prize if two or more #1 icon appear in a winning combination. The scatter symbol for this slot game is the trophy icon that used to appear anywhere on the five reels. It does generate payouts when it appears from any of the reels two or more times in a spin. To complete the winning combination, the icon does not necessarily needs to be on an active pay-line, and all the winnings are multiplied by the players’ total bet amount. The bonus symbol on the other hand is the wheelie symbol. The moment this icon appears on reels 2 and 4 in a single spin, the bonus round game is activated. With the help of the power symbols, the bonus games of Evel Knievel Slots games are activated and these include the free spin round game and the bonus game. The free spin bonus round game is activated by the time the trophy scatter symbol appear three or more times from any of the five reels. When this happens, 15 free spins are awarded to the player and all the wins during the round are tripled. Another generous round game of Evel Knievel Slots is the bonus game that is activated when the wheelie icon appears on reels 2 and 4 in a single spin. The number of pay-lines that pass through the wheelie symbol is also the number of times the winnings on this bonus round games can be multiplied. If you love motocross, and have been a fan of the known motorist Robert Craig Knievel, and wanted to play the Evel Knievel Slots, then you must rush to this casinos that are powered by Vegas Technology.